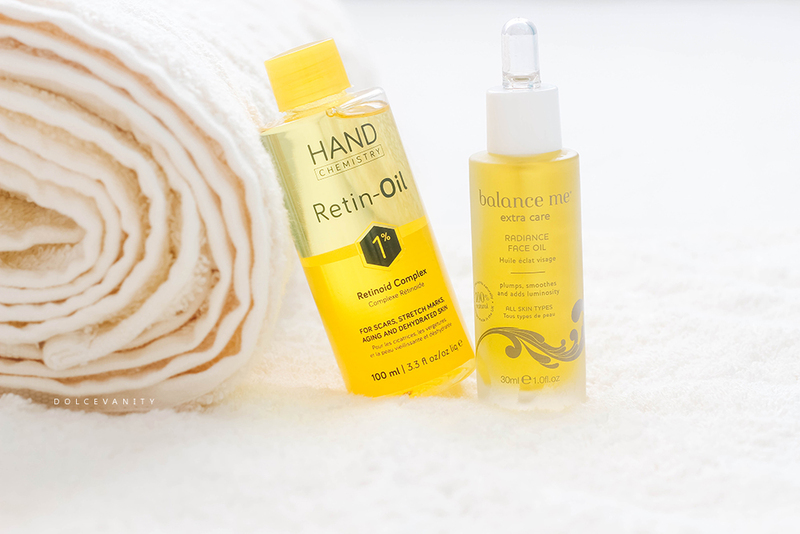 Hand Chemistry Retin-Oil x Balance Me Radiance Face Oil. I'm trying to strip back all my routines because nothing we do should feel complicated and overwhelming plus it's not the minimalist way. I've been using a few different oils, I'm trying to get my skin to feel more plump, glowing and even toned. Leading up to my cycle my skin was suffering a great deal, sometimes very lacklustre, oily some days, irritated the next it was so up and down so a lot of TLC was needed. Hand Chemistry is a new brand for me, never had I been alerted to them before I was sent a press release and the Hand Chemistry Retin - Oil caught my eye. Mostly because the word, retin, is included in the title. Retin is good for acne scarring although I do not suffer from acne mines more hormonal I'm often left with the constant reminder. Hydroxypinacolone retinoate (HPR) is the 4th ingredient in the listing for this oil so it's still quite high up. The claim is that within 2 weeks you'll notice an improvement in your skin, this is a dry oil and it's good as it doesn't feel overly greasy as if the skin is suffocating. I like to put this on at night, I finger tap it on my forehead but really massage it onto the places where my skin needs help. The bonus with this oil is that it's not restricted to the face but to be used all over the body. I started to use this on my backside stretch marks and also on my calfs. I have quite muscly calves and out of nowhere stretch marks appeared, I started to use this oil in the hopes that they start to fade a bit more surprisingly they had, the stretch marks were fading and the back of my legs and bum cheeks started to look more uniform in colour - now I'm going to use this on my dark spots! The Balance Me Radiance Oil has made its rounds in the beauty community being loved immensely and no wonder. It's a beautiful oil, the leaves the skin, supple and glowing. I use this especially after my intensive skin routine (facial steam / face masks...) to really get the skin pushing into the right direction. Sweet almond oil, grapeseed, rosehip oil, moringa, camellia, Roman chamomile and Rosemary are just some of the key ingredients. Roman Chamomile, I've wanted to try for so long, it's an expensive oil but it's good for fighting bacteria & for being an anti-inflammatory plus so much more. With all these effective oils that help reduce redness, spots, wrinkles it's no wonder this oil has been such a hit. I prefer to use this after my moisturiser so it seals everything in. I like to also use it on days when I'm not wearing any make-up so that's nearly daily. Gives a healthy glow and I know that it's targeting my skins needs. It's just the right amount of oiliness - sounds crazy, I know! Though some oils I find can be heavier than others while this one is a light - medium oil. I've truly loved adding this to my routine. Have you tried either of these oils?